Can you make money backing favourites? Most people tell you that there is no value in backing favourites and you should stay clear of them and look for those “outsiders” that come in now and then, at a really good value. …It’s not easy finding and identifying them. If you have read any of my articles then you are probably aware that I tend to go on about strike rate and average winning odds a lot. At the end of the day all that matters is that these two figures stack up and make you a profit. If you go for the lower strike rate range then you will need higher odds to make money. Where a higher strike rate means you need lower odds to make money. So it doesn’t matter if you are on favourites or outsiders the figures still have to add up. People love going on about finding value and if you like being a detective then it is really good fun. But value bets winning are rare and so even if you get good at spotting them your strike rate is still going to be low, meaning you will get a lot of losers before finding a winner. Looking for value bets also needs a big bank roll and you need to know when to take advantage of the odds available. I follow a number of systems like this and you soon find out that you have to go through losing runs of 20, 30 or even 50, to make these systems work. Not many people are prepared to do this and not many people have the bank to support it. …I am just saying it probably doesn’t want to be your only strategy. But we have already talked about there being no profit in favourites so what else can we do? Well let’s discuss that for a moment. Let us say that we came up with a system that uses favourites and has an average strike rate of 50%. That means “on average” we win one bet and we lose one bet. So every time we lose…we lose 1 point which means every time we win we need to do better than 1 pt to make money. In fact if we take Betfair prices where we can generally do a little better then we need an average winning price of 1.05, just to break even. So let’s say for arguments sake we get on average a winning price 1.26 (2.26). 50 * 1.20 = 60 – 50 = 10 points. So as you can see we don’t have to have a very high “average winning odds” to make a decent amount of points every month. The thing is to test…it’s no good saying you cannot make money on favourites unless you try some strategies over 2 or 3 months. If you pick well then even if you don’t get the prices you need. You are unlikely to lose as much as you would following a low strike rate high value system with long losing runs. Today I want to tell you about one of my favourite tipping teams at the moment. This dynamic duo have just made 52 points profit in the past week, with six winning days from seven. It's not like that all the time obviously, but the profit has been pretty consistent since they launched their tipping service in June this year. 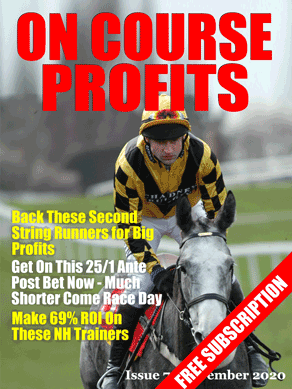 The service is called Racing Consultants and relies on the joint expertise of David Massey and Rory Delargy. You may have heard these guys sharing their expertise on Timeform radio and Will Hill radio. These are form experts that know racing inside out and who get together each evening to go through the next day's race cards and find the value bets. Their service is currently available at just £29.99 per month and is an absolute bargain and my current favourite service. Do you bet in multiples? Doubles, trebles or acca's (accumulators)? I have always been of the opinion that these types of bets are just for the bookies benefit and have always avoided them, even though there is a promise of huge profits if they come off. I do remember a few years back reading an article about how if you are making value bets, if you combine them into doubles or trebles that you magnify the advantage that you have because the value multiplies. But that didnt change my methods. The results from yesterday's Racing Consultants tips have caused me to think again. Yesterday they gave three selections to be combined into a half point each way Trixie. A Trixie is 3 doubles (eachway doubles in this case) and a treble, so four bets. A £5 eachway Trixie where only two of the horses won paid £376, which is a £336 profit! That's a big return from getting just two bets home. But the thing that really surprised me is that if they had got all three home the return would have been £5,620 for a £40 outlay. I need to re-think my betting and staking strategy. Do you bet in multiples? Tell me in the comments, if you've had any big wins tell me that also.